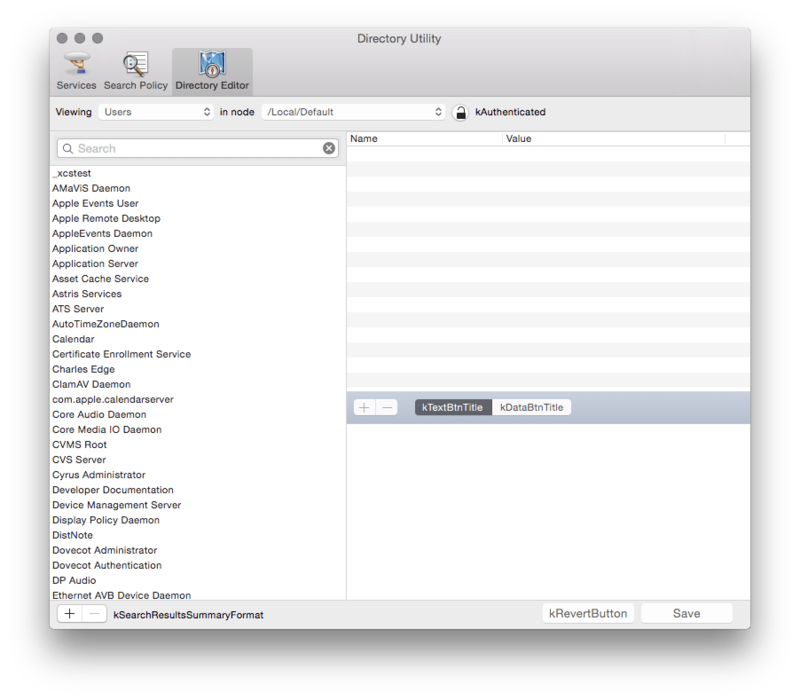 People who have managed Open Directory and will be moving to Synology will note that directory services really aren’t nearly as complicated was we’ve made them out to be for years. This is because Apple was protecting us from doing silly things to break our implementations. 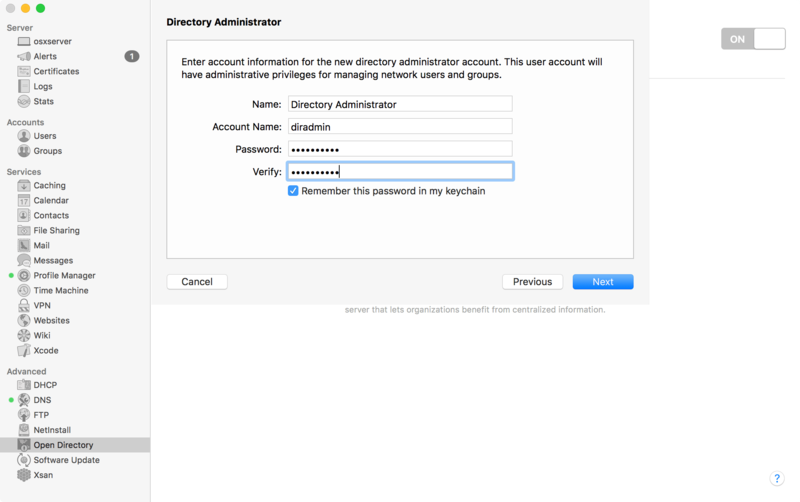 It was also because Apple bundled a number of seemingly disparate technologies into ldap. 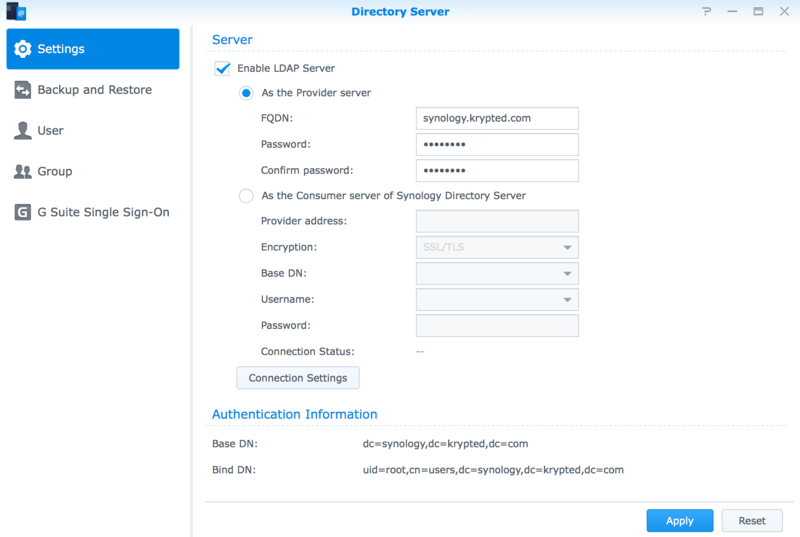 It’s worth mentioning that LDAP on a Synology is LDAP. We’re not federating services, we’re not kerberizing services, we’re not augmenting schemas, etc. 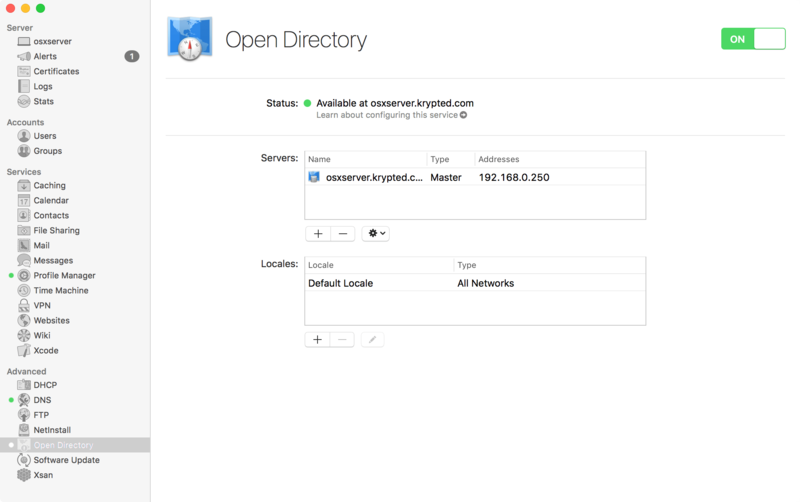 We can leverage the directory service to provide attributes though, and have that central phone book of user and group memberships we’ve come to depend on directory services to provide. To get started, open the Package Center and search for Directory. 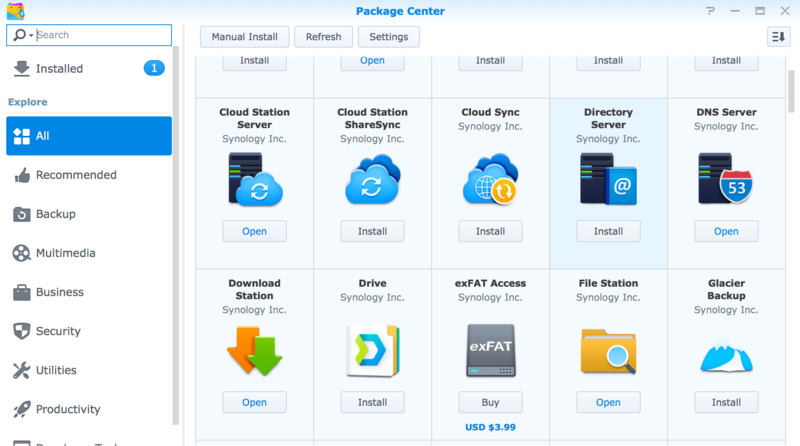 Click Install for the Directory Server and the package will be installed on the Synology. 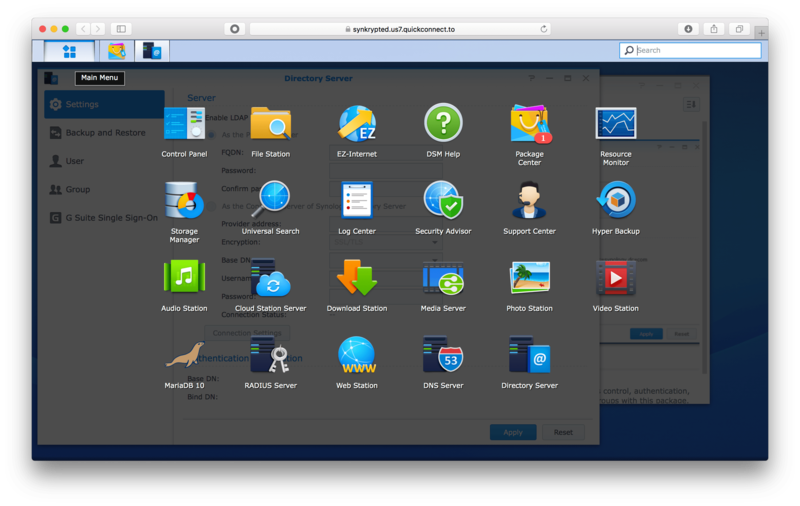 When the setup is complete, open the Directory Server from the launcher available in the upper right hand corner of the screen. 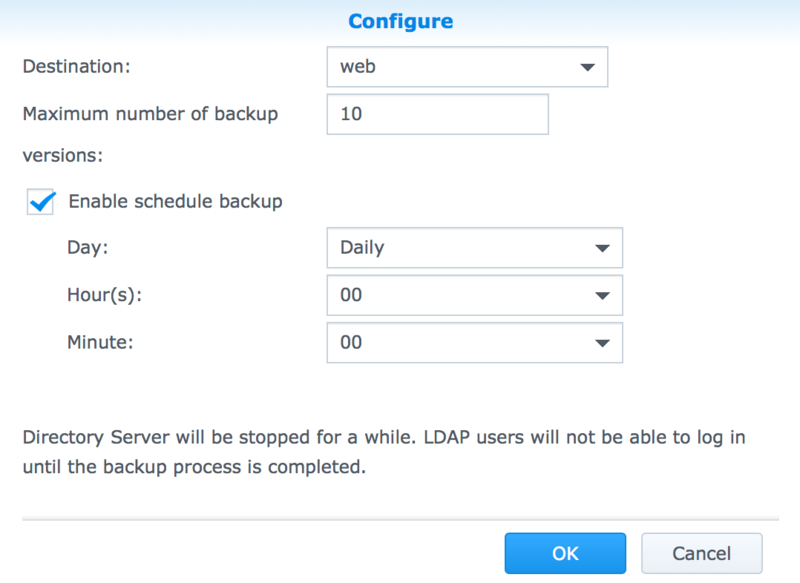 The LDAP server isn’t yet running as you need to configure a few settings before starting. At the Settings screen, you can enable the LDAP service by checking the box to “Enable LDAP Service” and providing the hostname (FQDN) of the service along with a password. If this is for internal use, then it’s all setup. 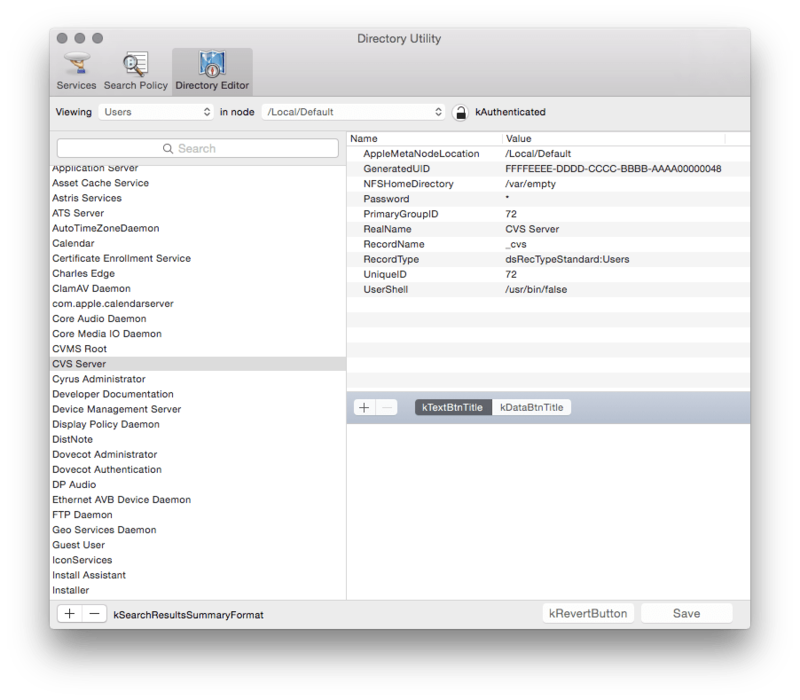 If you’ll be binding external services to this LDAP instance, make sure to open ports 389 (for LDAP) and/or 636 (for LDAP over SSL) as well. Once you have information in the service, you’ll want to back it up. 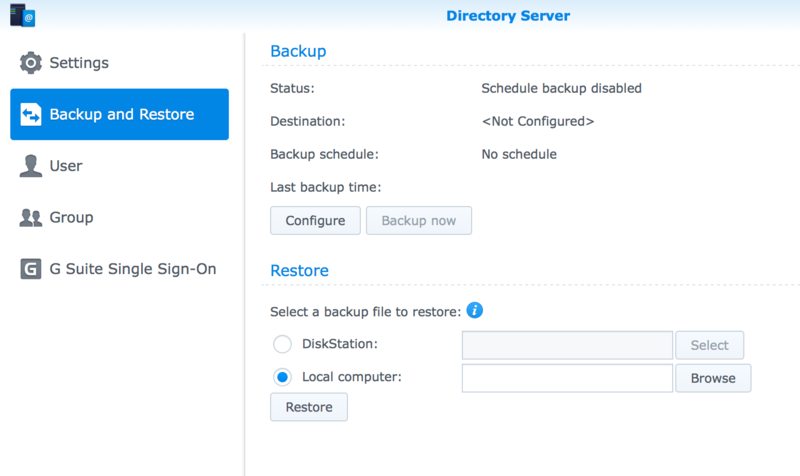 Click on Backup and Restore. Then click on Configure. At the Configure screen, choose a destination. 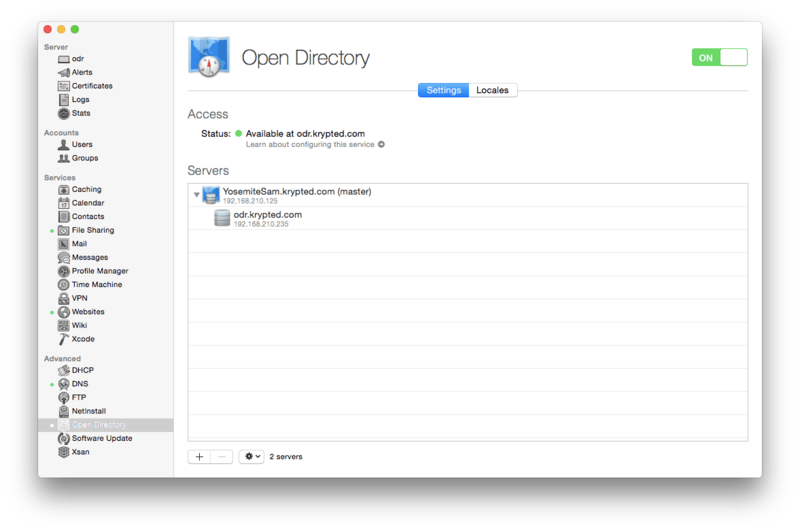 I prefer using a directory I can then backup with another tool. Once you have defined a place to store your backups using the Destination field, choose a maximum number of backups and configure a schedule for the backups to run (by default backups run at midnight). Then click OK. You now have a functional LDAP service. To create Groups, click on the Group in the left sidebar. 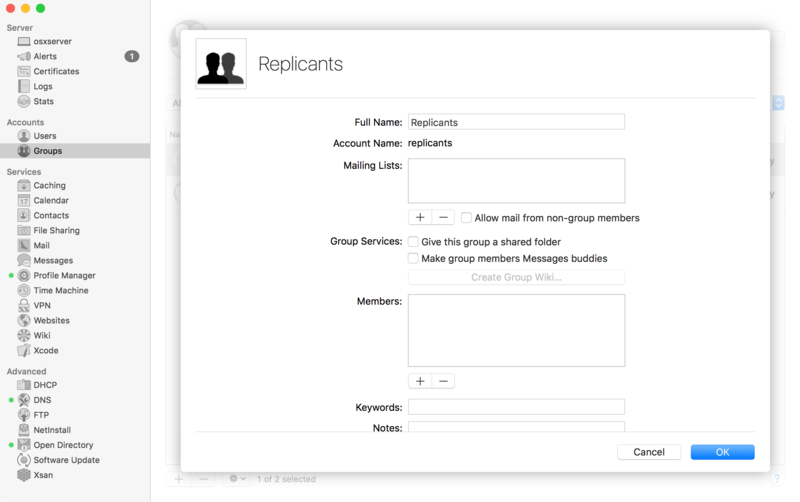 Here, you can easily create groups by clicking on the Create button. 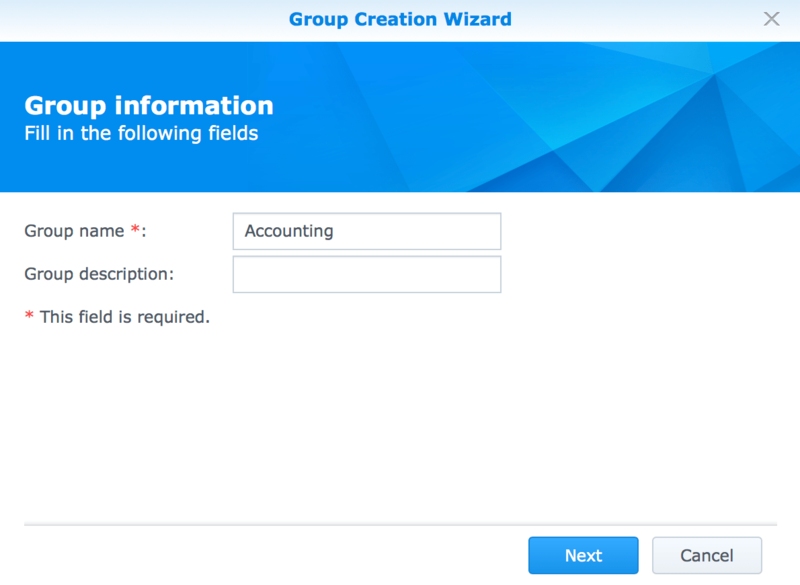 At the wizard, provide a group name and then enter the name of a group (accounting in this example). Click Next, then Apply to finish creating the group. 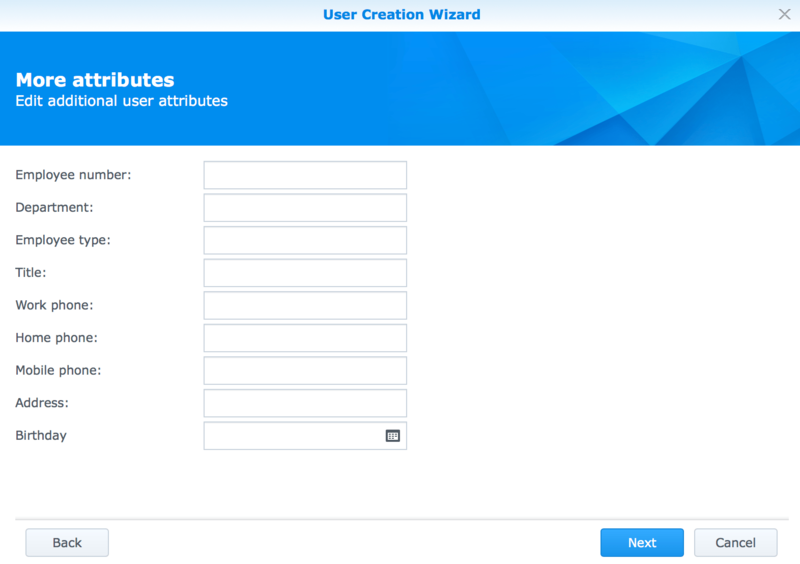 One you have created your groups, click on User to start entering your users. Click Create. At the User Information screen, enter the name, a description if needed, and the password for a user. 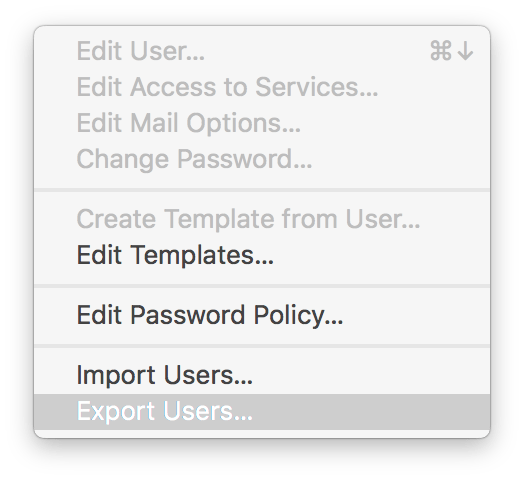 You can also restrict password changes and set an expiration for accounts. 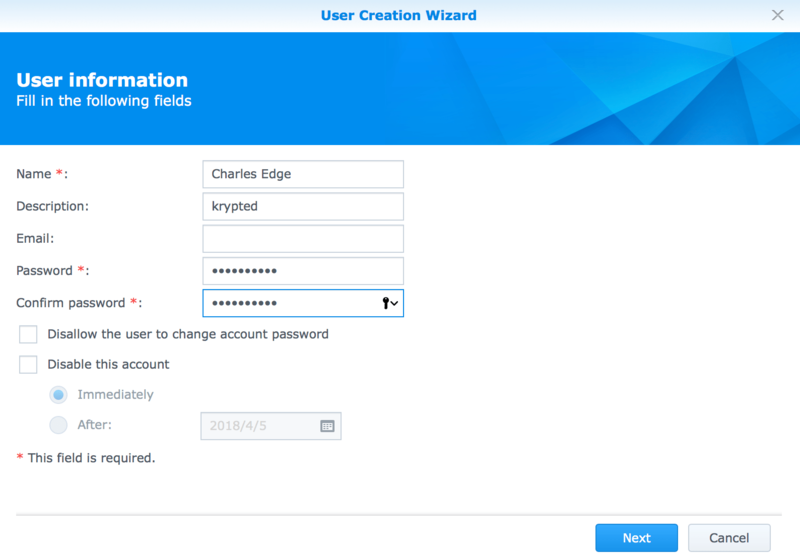 Click Next to create the user. At the next screen, choose what groups the new user will be in and click Next. Enter any extended attributes at the next screen, if you so choose (useful for directories). Click Next and then Apply. 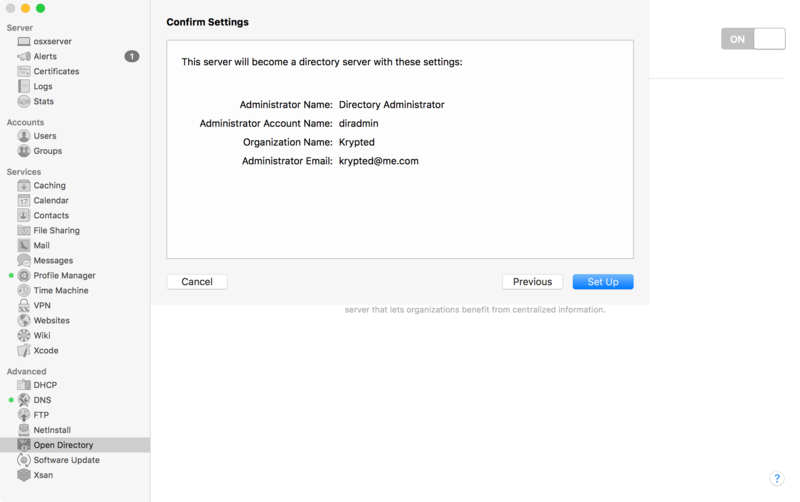 https://github.com/futurice/futurice-ldap-user-manager ), LAM ( https://www.ldap-account-manager.org/lamcms/ ), LinID ( http://www.linid.org/welcome/index.html )or other tools. 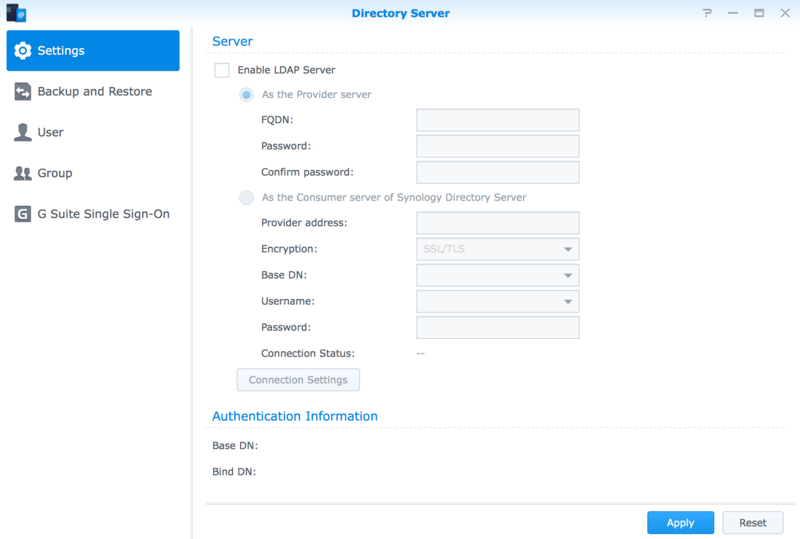 I wrote an article on LDAP SACLs awhile back, so I’ll try and track that down and update it for Synology soon! 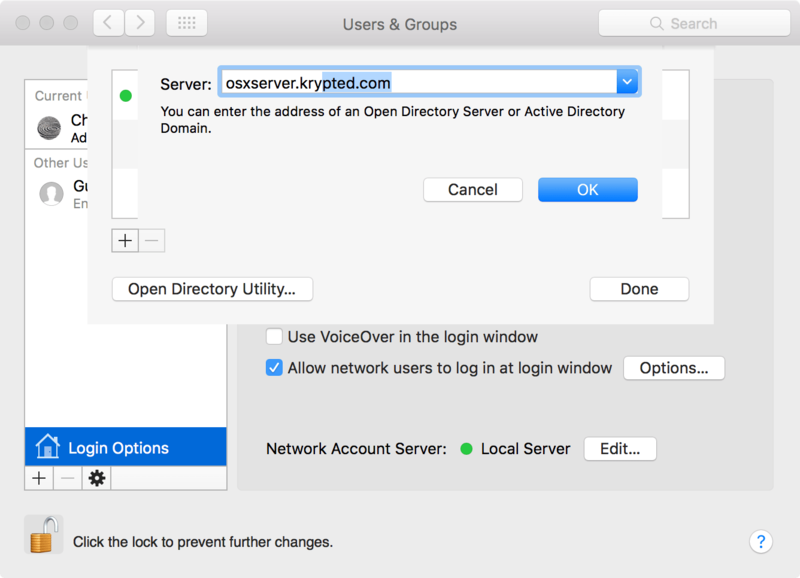 There are a number of ways to create groups in OS X Server 5, running on Yosemite or El Capitan. 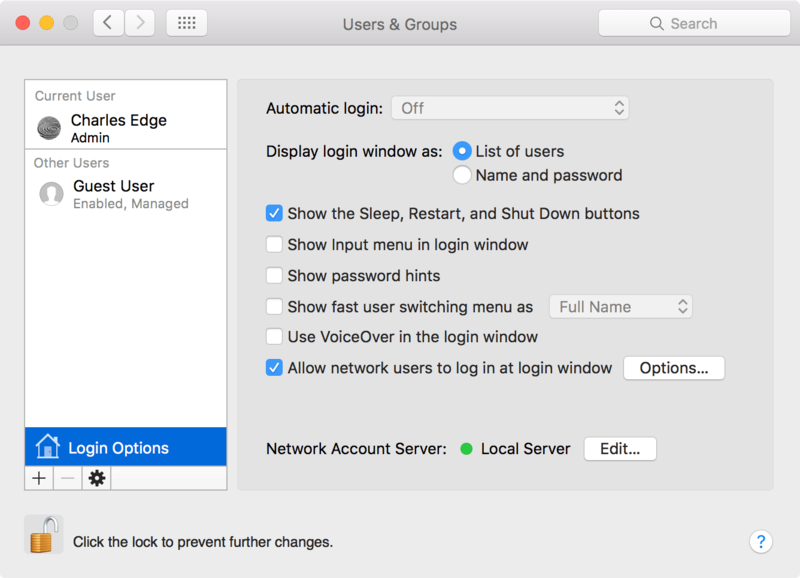 The first is using the Server app, the second is using Workgroup Manager (which requires a little work to get working in El Capitan), the third is using the Users & Groups System Preference pane and the fourth is using the command line. 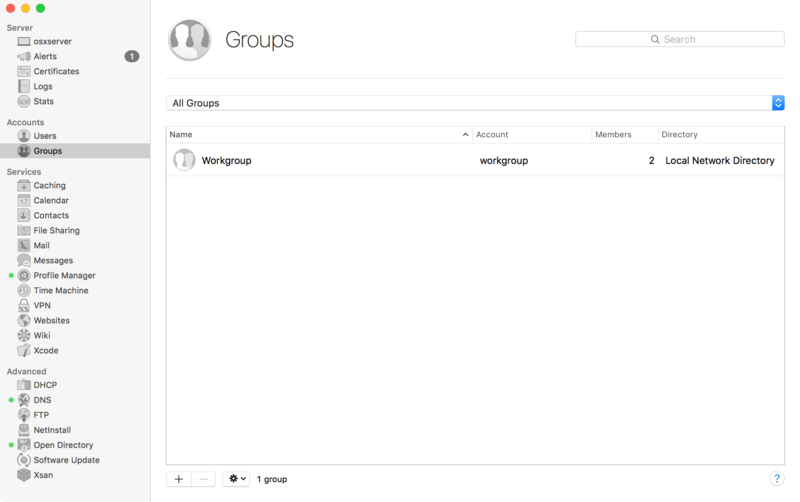 In this article we will look at creating groups in the Server app. 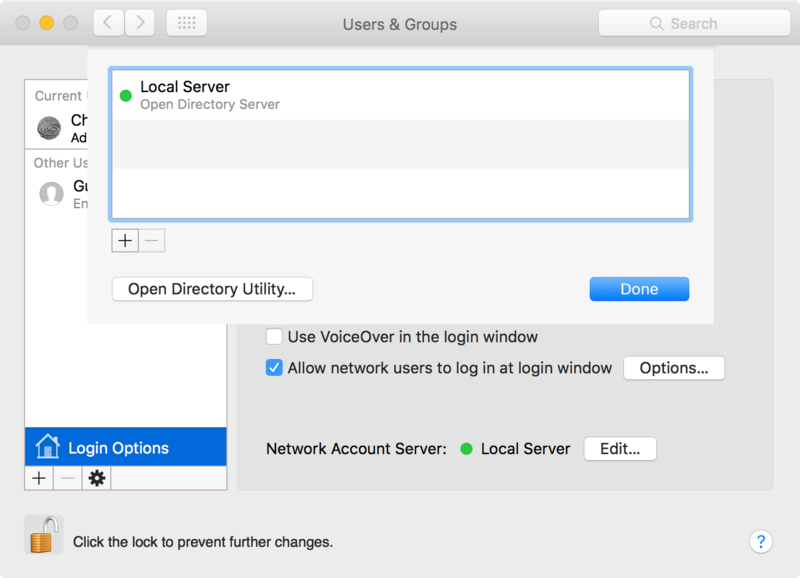 Once a server has been an Open Directory Master all user and group accounts created will be in the Local Network Group when created in Server app. Before that, all user and group objects are stored locally when created in Server app. 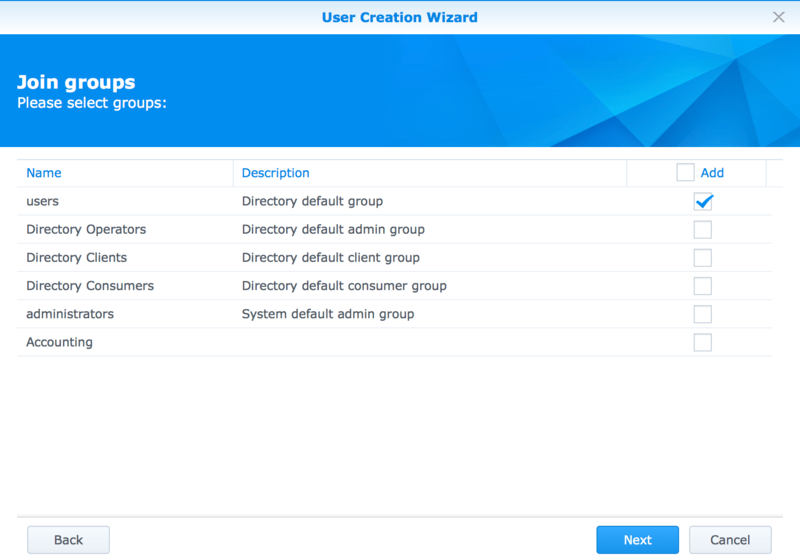 Once promoted to an Open Directory server, local groups must be created in Workgroup Manager, the Users & Groups System Preference pane or using a command line tool appropriate for group management. The command to create and tear down an Open Directory environment is slapconfig. 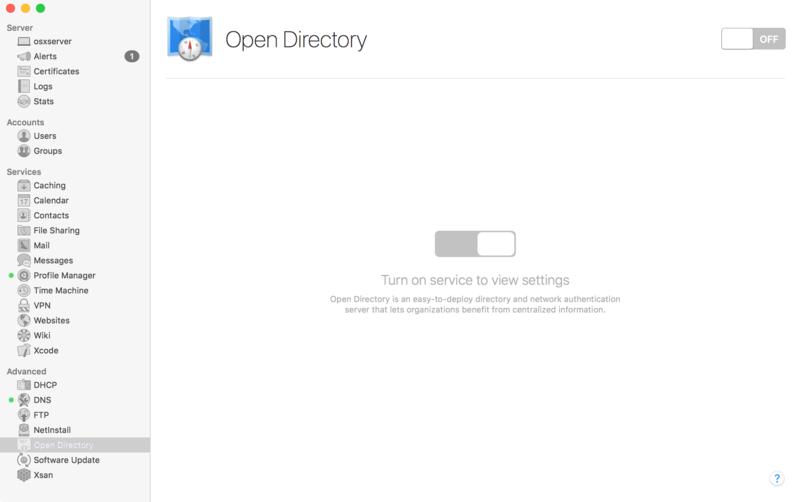 When you disable Open Directory from the Server app you aren’t actually removing users. To do so, you’d use slapconfig along with the -destroyldapserver. When run, you get a little insight into what’s happening behind the scenes. This results in the following: bash-3.2# slapconfig -destroyldapserver The logs are as follows: 2015-09-08 04:17:58 +0000 slapconfig -destroyldapserver 2015-09-08 04:17:58 +0000 Deleting Cert Authority related data 2015-09-08 04:17:58 +0000 Removed directory at path /var/root/Library/Application Support/Certificate Authority/Krypted Open Directory Certificate Authority. 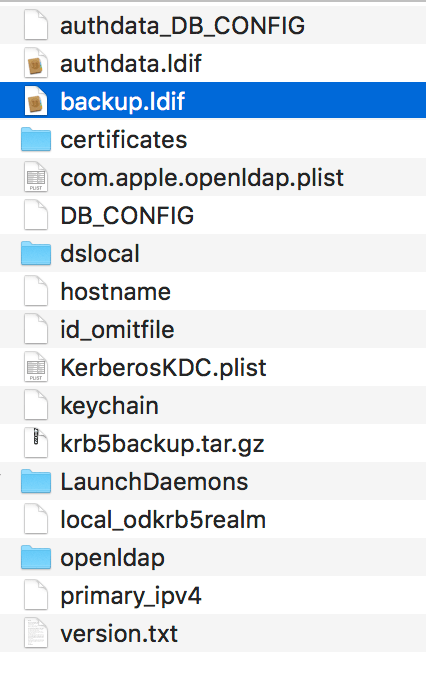 2015-09-08 04:17:58 +0000 command: /usr/sbin/xscertadmin add –reason 5 –issuer Krypted Open Directory Certificate Authority –serial 3449505949 2015-09-08 04:18:19 +0000 command: /bin/launchctl unload -w /System/Library/LaunchDaemons/com.apple.xscertd.plist 2015-09-08 04:18:19 +0000 command: /bin/launchctl unload -w /System/Library/LaunchDaemons/com.apple.xscertd-helper.plist 2015-09-08 04:18:19 +0000 command: /bin/launchctl unload -w /System/Library/LaunchDaemons/com.apple.xscertadmin.plist 2015-09-08 04:18:19 +0000 Stopping LDAP server (slapd) 2015-09-08 04:18:20 +0000 Stopping password server 2015-09-08 04:18:24 +0000 Removed all service principals from keytab for realm OSXSERVER.KRYPTED.COM 2015-09-08 04:18:24 +0000 Removed file at path /var/db/openldap/openldap-data/__db.001. 2015-09-08 04:18:24 +0000 Removed file at path /var/db/openldap/openldap-data/__db.002. 2015-09-08 04:18:24 +0000 Removed file at path /var/db/openldap/openldap-data/__db.003. 2015-09-08 04:18:24 +0000 Removed file at path /var/db/openldap/openldap-data/__db.004. 2015-09-08 04:18:24 +0000 Removed file at path /var/db/openldap/openldap-data/__db.005. 2015-09-08 04:18:24 +0000 Removed file at path /var/db/openldap/openldap-data/__db.006. 2015-09-08 04:18:24 +0000 Removed file at path /var/db/openldap/openldap-data/altSecurityIdentities.bdb. 2015-09-08 04:18:24 +0000 Removed file at path /var/db/openldap/openldap-data/apple-config-realname.bdb. 2015-09-08 04:18:24 +0000 Removed file at path /var/db/openldap/openldap-data/apple-generateduid.bdb. 2015-09-08 04:18:24 +0000 Removed file at path /var/db/openldap/openldap-data/apple-group-memberguid.bdb. 2015-09-08 04:18:24 +0000 Removed file at path /var/db/openldap/openldap-data/apple-group-nestedgroup.bdb. 2015-09-08 04:18:24 +0000 Removed file at path /var/db/openldap/openldap-data/apple-group-realname.bdb. 2015-09-08 04:18:24 +0000 Removed file at path /var/db/openldap/openldap-data/apple-hwuuid.bdb. 2015-09-08 04:18:24 +0000 Removed file at path /var/db/openldap/openldap-data/cn.bdb. 2015-09-08 04:18:24 +0000 Removed file at path /var/db/openldap/openldap-data/DB_CONFIG. 2015-09-08 04:18:24 +0000 Removed file at path /var/db/openldap/openldap-data/dn2id.bdb. 2015-09-08 04:18:24 +0000 Removed file at path /var/db/openldap/openldap-data/entryCSN.bdb. 2015-09-08 04:18:24 +0000 Removed file at path /var/db/openldap/openldap-data/entryUUID.bdb. 2015-09-08 04:18:24 +0000 Removed file at path /var/db/openldap/openldap-data/gidNumber.bdb. 2015-09-08 04:18:24 +0000 Removed file at path /var/db/openldap/openldap-data/givenName.bdb. 2015-09-08 04:18:24 +0000 Removed file at path /var/db/openldap/openldap-data/id2entry.bdb. 2015-09-08 04:18:24 +0000 Removed file at path /var/db/openldap/openldap-data/ipHostNumber.bdb. 2015-09-08 04:18:24 +0000 Removed file at path /var/db/openldap/openldap-data/log.0000000001. 2015-09-08 04:18:24 +0000 Removed file at path /var/db/openldap/openldap-data/macAddress.bdb. 2015-09-08 04:18:24 +0000 Removed file at path /var/db/openldap/openldap-data/mail.bdb. 2015-09-08 04:18:24 +0000 Removed file at path /var/db/openldap/openldap-data/memberUid.bdb. 2015-09-08 04:18:24 +0000 Removed file at path /var/db/openldap/openldap-data/objectClass.bdb. 2015-09-08 04:18:24 +0000 Removed file at path /var/db/openldap/openldap-data/ou.bdb. 2015-09-08 04:18:24 +0000 Removed file at path /var/db/openldap/openldap-data/sn.bdb. 2015-09-08 04:18:24 +0000 Removed file at path /var/db/openldap/openldap-data/uid.bdb. 2015-09-08 04:18:24 +0000 Removed file at path /var/db/openldap/openldap-data/uidNumber.bdb. 2015-09-08 04:18:24 +0000 Removed file at path /var/db/openldap/authdata/__db.001. 2015-09-08 04:18:24 +0000 Removed file at path /var/db/openldap/authdata/__db.002. 2015-09-08 04:18:24 +0000 Removed file at path /var/db/openldap/authdata/__db.003. 2015-09-08 04:18:24 +0000 Removed file at path /var/db/openldap/authdata/__db.004. 2015-09-08 04:18:24 +0000 Removed file at path /var/db/openldap/authdata/__db.005. 2015-09-08 04:18:24 +0000 Removed file at path /var/db/openldap/authdata/__db.006. 2015-09-08 04:18:24 +0000 Removed file at path /var/db/openldap/authdata/alock. 2015-09-08 04:18:24 +0000 Removed file at path /var/db/openldap/authdata/authGUID.bdb. 2015-09-08 04:18:24 +0000 Removed file at path /var/db/openldap/authdata/DB_CONFIG. 2015-09-08 04:18:24 +0000 Removed file at path /var/db/openldap/authdata/dn2id.bdb. 2015-09-08 04:18:24 +0000 Removed file at path /var/db/openldap/authdata/draft-krbPrincipalAliases.bdb. 2015-09-08 04:18:24 +0000 Removed file at path /var/db/openldap/authdata/draft-krbPrincipalName.bdb. 2015-09-08 04:18:24 +0000 Removed file at path /var/db/openldap/authdata/entryCSN.bdb. 2015-09-08 04:18:24 +0000 Removed file at path /var/db/openldap/authdata/entryUUID.bdb. 2015-09-08 04:18:24 +0000 Removed file at path /var/db/openldap/authdata/id2entry.bdb. 2015-09-08 04:18:24 +0000 Removed file at path /var/db/openldap/authdata/log.0000000001. 2015-09-08 04:18:24 +0000 Removed file at path /var/db/openldap/authdata/objectClass.bdb. 2015-09-08 04:18:24 +0000 Removed directory at path /var/db/openldap/authdata. 2015-09-08 04:18:24 +0000 Removed file at path /etc/openldap/slapd_macosxserver.conf. 2015-09-08 04:18:24 +0000 Removed file at path /etc/openldap/slapd.conf. 2015-09-08 04:18:24 +0000 Removed file at path /etc/openldap/rootDSE.ldif. 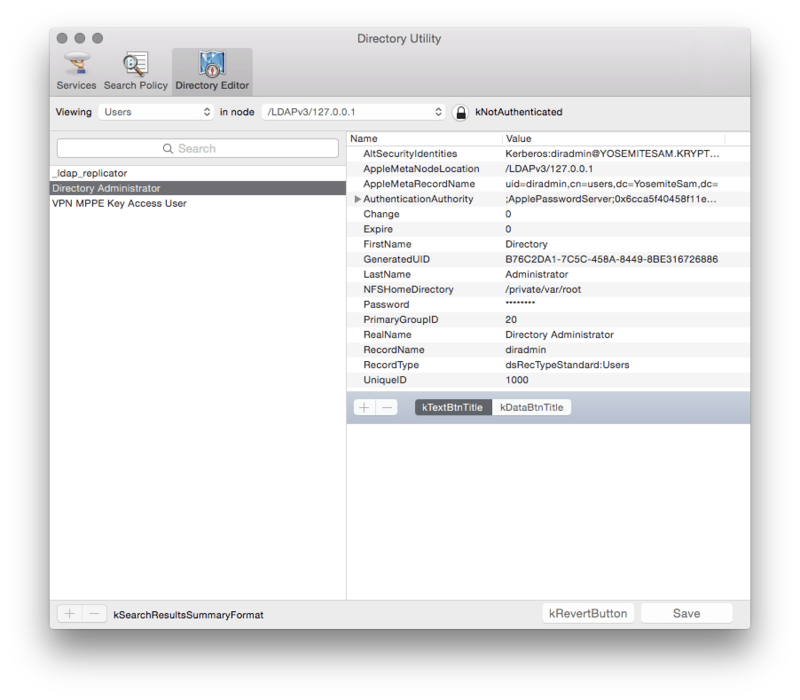 2015-09-08 04:18:24 +0000 Removed file at path /var/db/dslocal/nodes/Default/groups/com.apple.access_dsproxy.plist. 2015-09-08 04:18:24 +0000 Removed directory at path /etc/openldap/slapd.d/cn=config. 2015-09-08 04:18:24 +0000 Removed file at path /etc/openldap/slapd.d/cn=config.ldif. 2015-09-08 04:18:24 +0000 Removed directory at path /etc/openldap/slapd.d. 2015-09-08 04:18:24 +0000 Removed directory at path /etc/openldap/slapd.d.backup/cn=config. 2015-09-08 04:18:24 +0000 Removed file at path /etc/openldap/slapd.d.backup/cn=config.ldif. 2015-09-08 04:18:24 +0000 Removed directory at path /etc/openldap/slapd.d.backup. 2015-09-08 04:18:27 +0000 Stopping password server 2015-09-08 04:18:27 +0000 Removed file at path /etc/ntp_opendirectory.conf. 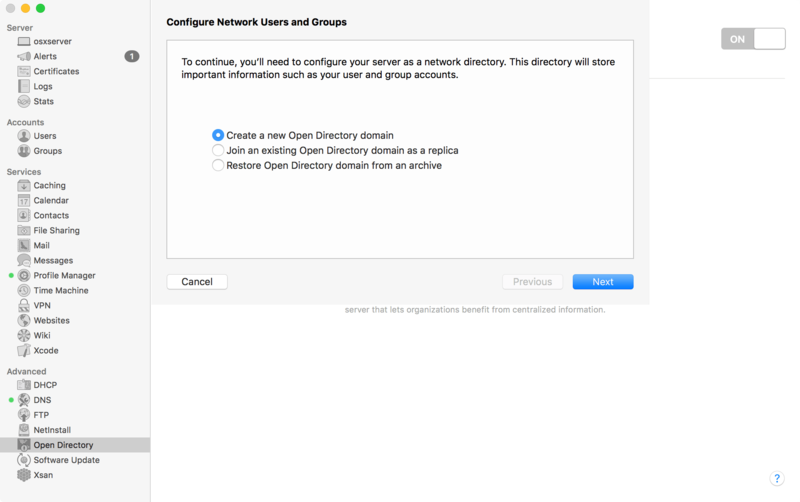 2015-09-08 04:18:27 +0000 Removed file at path /Library/Preferences/com.apple.openldap.plist.